2 modes select: Original mode & Power increase mode. Suit for diesel common rail cars use. Car model: Toyota Hilux Vigo, Innova, Fortuner/ Mitsubishi Triton, Pajero Sport/ Nissan Navara...etc cars. Easy to install: Plug and Play. No need to cut wire. No have car's warranty problem. 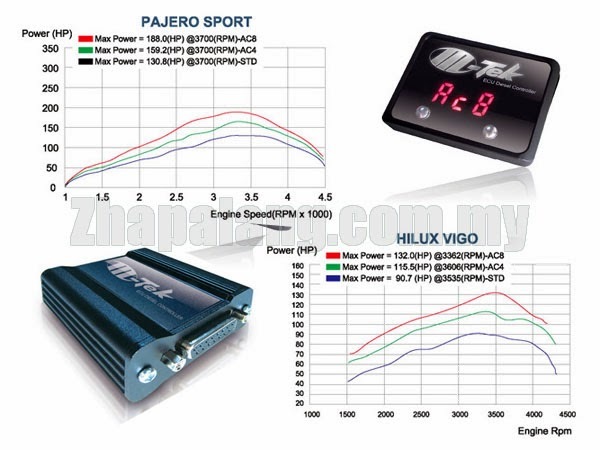 Horse power increase: It can increase your car's horse power 15~40% up. Torque increase: It can increase your car's Torque 20~40% up. *M-TEK ECU Diesel Controller are all on site tuning in Malaysia, therefore its 100% fine tune and suitable for local car.